A New Update on Our "Trade of the Decade"
How can we take your recommendations seriously when you missed the biggest bull market of our lifetimes? He was referring to the big run-up in stock prices since 2009. We strongly object. That is a gross misrepresentation of our record! First, we don’t give recommendations; we just tell you what we’re thinking and doing. Giving advice requires far more confidence in our own opinions than we have. Second, we didn’t miss one of the biggest bull markets of our lifetimes; we missed two of them! Yesterday, the Dow fell 275 points – or 1.6%. This followed news that a key measure of the health of the U.S. manufacturing sector, the ISM Manufacturing Index, revealed a second month of contraction in December. “The Fed should not be raising rates,” said some Wall Street analysts. “Don’t worry about it. As long as services are still expanding, we’re all right,” said others. Most likely, they will both be proven correct: We’re all right… until we’re not. And when it becomes obvious that we’re not, the Fed will put an end to its rate hikes. Which takes us back to… us. We began writing a daily e-letter in 1998. Back then, it looked to us as though investors had gone a little loopy in the dot-com craze. And after 16 years of falling inflation and rising stocks, it looked to us as though that long cycle was coming to an end. The late Richard Russell had taught us that markets move in large swings – from cheap to expensive and back again. You can never know when prices are going up or down. But the time to buy is when they are at historic lows. The time to sell is when they are at historic highs. Everything else is noise and muddled guessing. Buy gold. Sell U.S. stocks. Few people today believe gold is a good investment. Even fewer were bullish on gold at the start of the new millennium. We can’t remember the last time we read a positive comment on gold in the mainstream press. Gold has been in a bear market for the last four and a half years. In U.S. dollar terms, it’s lost 44% of its value since hitting an all-time high of $1,921 on September 6, 2011. Meanwhile, at the dawn of the new millennium, U.S. stocks were the place to be. They had been going up in a more or less permanent bull market that began in 1982 with the Dow under 1,000. By January 2000, the Dow had risen to 11,723. “The top is in,” we wrote. Actually, we don’t know what we wrote. But we must have thought the top was in because we were proposing to get out of U.S. stocks… and to stay out for at least the next 10 years. January 1 was a holiday in 2000, as it was in 2016. It was a Saturday to boot. But when markets opened on Monday, you could buy an ounce of gold for $288. 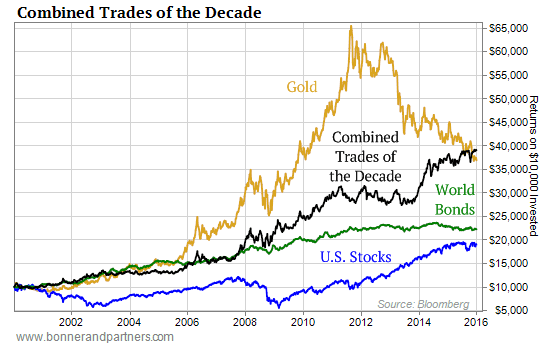 If you had done the simplest thing – sell your U.S. stocks and put the money into gold – as of yesterday, you would have watched a $10,000 investment turn into roughly $37,000. If you had stuck with stocks, on the other hand, and NOT missed the two great bull markets – of 2001 to 2007 and 2009 to 2015 – you would have watched your $10,000 become almost $19,000 (including dividends). This is still much better than what most investors earned. Most traded in and out of stocks over the last 15 years – most often buying and selling the worst stocks at the worst times. This would have gotten you only a fraction of the buy-and-hold return… and most likely a negative result. So, guess what – missing bull markets in stocks is no sin. Catching them is no virtue. And even after losing more than one-third of its value, gold is still not such a bad place for your money! But what if you’d followed the rest of our formula? This time: Buy Japanese stocks. Sell Japanese government bonds (JGBs). 1. What if you had been more aggressive in our first Trade of the Decade and, between 2000 and 2010, you’d shorted (i.e., bet against) the S&P 500 as well as bought gold? 2. What if you had bailed out of gold on January 1, 2010… bought Japanese stocks… and switched from shorting the S&P 500 to shorting JGBs? These calculations take more space than the back of our envelope provides, so we turned to Bonner & Partners researcher Nick Rokke. 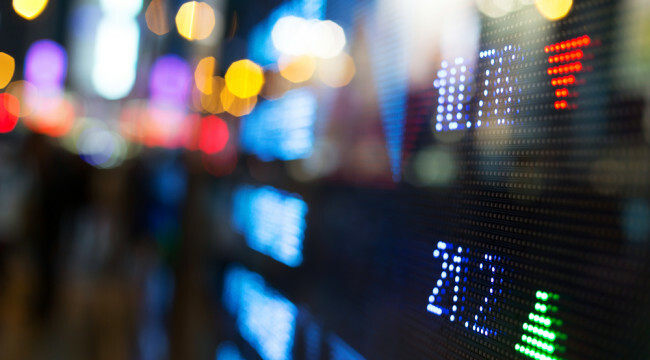 Adjusting for fluctuations in the yen against the dollar… adding in dividends… and accounting for the short positions against U.S. stocks and JGBs, Nick crunched the numbers. And he came up with the returns you would have made on our combined Trades of the Decade between 2000 and today. And as you can see, this simple strategy beat all major asset classes. But it’s all right with us.